Are you looking for a relatively decent protective case for the Google Nexus 5, but don’t want to fork over the moolah for something from an unknown maker? Well, you’re in luck because Spigen has an option for you in its Ultra Fit case. Okay, it’s not the most grandiose or protective case we’ve seen from Spigen, but for those who want something form fitting without spending a fortune, this might be the perfect solution. Essentially, it’s a snap-on case that covers the entire rear of the Google Nexus 5 – leaving only the display exposed. In terms of size, it’s form-fitting and doesn’t add a whole lot of bulk to the handset’s already manageable size. Constructed out of premium polycarbonate plastic with a urethane coating, which gives it a ‘soft feel’ touch, it’s sturdy enough to protect the smartphone from scratches. However, we wouldn’t necessarily say that it’s sufficient to cushion a fall or drop. One point worth mentioning is that with the urethane coating, it helps to prevent discoloration over a period of time. Of course, cutouts around the sides of the phone allow us access to all of its ports and buttons – albeit, the cutout for the power button makes it just a little difficult in feeling it out. With the top and bottom sides, they’re pretty much left exposed, which is good for the 3.5mm headset jack because it means there won’t be issues connecting a wide array of headphones to it, especially those with wider jacks. Overall, the design of the Spigen Google Nexus 5 is as generic as it gets. 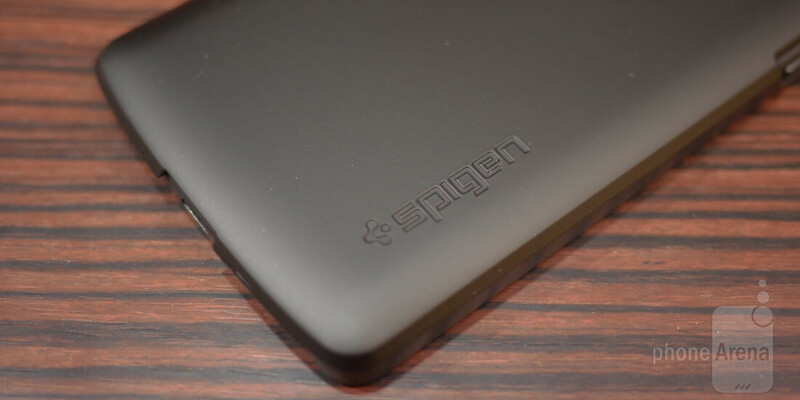 Thankfully, Spigen offers the case in black, white, and red colors – so there is at least some options for you. Like we mentioned already, you won’t have to spend a fortune on this one, seeing that it’s currently selling for as low as $8.00 through Amazon.